In the right circumstances, microlearning is one of the most valuable e-learning tools available. It involves developing a course in short modules, where the learner can complete the module in as little as five minutes. This helps keep learners engaged plus it encourages them to keep coming back to the course until they have it complete. The latter is because they know they don’t need to allocate a large block of time – five minutes while waiting for the dinner to cook, for example, is all they need. It is not surprising, then, that so many businesses in Dubai and elsewhere use microlearning when creating e-learning courses. What does a good microlearning course look like, however? 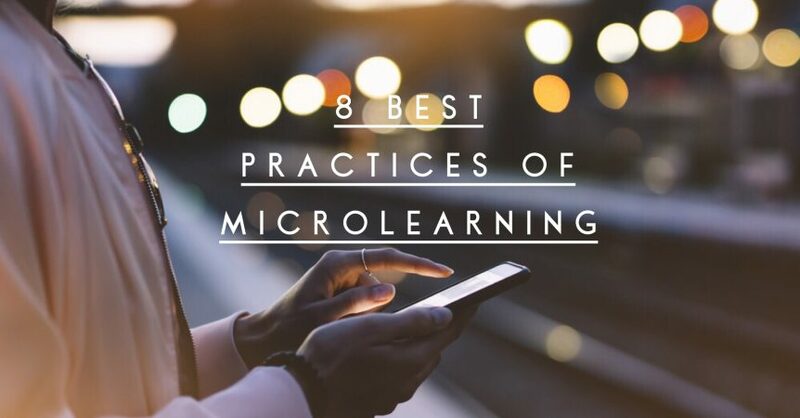 Here are eight best practice tips for creating microlearning courses that get results. Clutter slows learners up and gets in the way of what you want to achieve with microlearning. Therefore, you should remove all clutter from your course. You should go as far as removing greetings and other superfluous content that can be considered a formality rather than essential to the topic of the course. You should also break down the content of the course, so each module focuses on a single idea. This could be a skill, a piece of knowledge, something that bridges a gap between larger ideas, etc. After all, when you try to cover too much in a module, the length increases, and you start to drift away from e-learning principles. Focusing on one idea per module also assists learners in getting through the course successfully as it helps them fully grasp that single idea before moving on. As mentioned above, removing clutter from an e-learning course is important in microlearning. This includes media, but you shouldn’t go too far. After all, audio, video, and images are important elements in a good e-learning course, so you need to retain them in a course that adopts microlearning principles too. Why? Media elements help present ideas and concepts in ways that are easier to understand than text. Media also makes the course look more attractive and professional, as well as helping keep learners engaged. One of the mistakes people often make when creating a microlearning course is making assessments long. Assessments should be treated the same as all other modules of the course, however. In other words, they should be short and as highly focused as practicable. Microlearning courses fit perfectly into flexible learning strategies. Flexible learning involves creating a wide variety of courses for people on your team and then making them available as and when they need them. This approach empowers learners and ensures they have the content they need when they need it. Learners are also more motivated to learn when they are given more autonomy. You always need to focus on learners when creating e-learning courses – or any other sort of training for that matter. Microlearning gives you more opportunities to do so than normal, however. When doing this, you should think about what the learner needs to know, but you should also think about how they will complete the course. Including subtitles on videos, for example, lets learners go through a module even though they are in a public place. Another example is audio which learners can engage with when doing tasks like walking. It is also essential you make the course mobile-friendly. This lets learners complete modules whenever and wherever they are. When doing this, don’t just focus on the visual aspects of the course as it is also important you ensure all elements of the course work properly on a mobile device. Think carefully about the course navigation, for example. A small arrow to click to the next page might be perfect when a learner is doing the course on a computer, but this will be difficult if the learner tries to tap the same navigation arrow using their finger on a phone. Following on from the last point, the more you can make the modules available offline, the more opportunities you will give the learner to complete them when and where they want to. Again, this will encourage them to complete the course as well as help you maximise retention rates. Of course, you must balance this with functionality. After all, you probably won’t want to download a full course with lots of video and other media elements to each learner’s phone as the size will be prohibitive. The more you can make available offline, however, the better. Microlearning will deliver real results and will improve training in your business. Using the best practices above is the best way to get its full range of benefits.